The Congressional Budget Office1 on Monday announced an unsurprising but important conclusion: The Senate version of the Republican effort to repeal and replace the Affordable Care Act is broadly similar to the House version that has been discussed for months. The Senate bill, if it becomes law, is likely to increase the number of uninsured Americans by 22 million by 2026, compared to what would happen if the Affordable Care Act stayed in place, according to the CBO. It would also reduce the number of people on Medicaid by 15 million by 2026. And it would reshuffle the private insurance system set up under Obamacare in a way that is likely to increase costs for older people, while reducing premiums and other costs for some younger people. 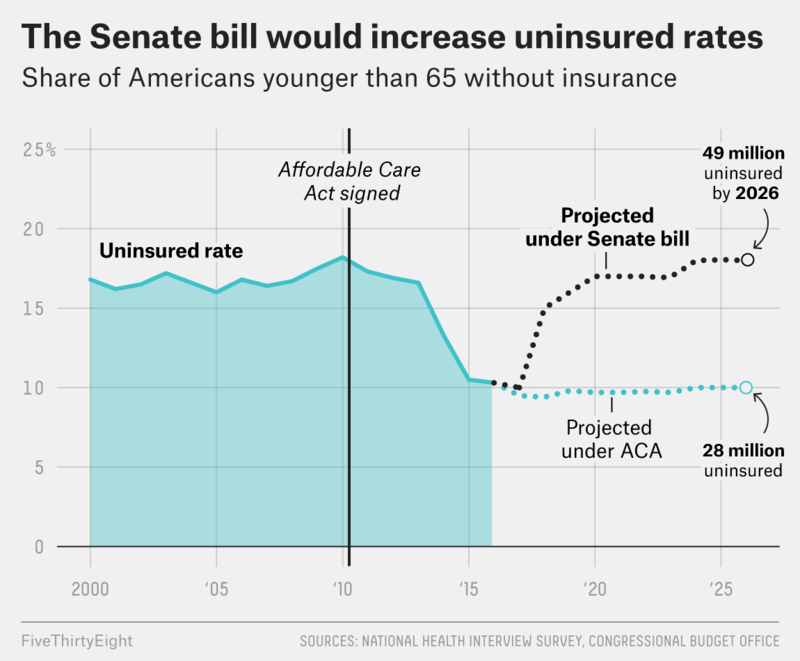 The overall number of uninsured people is projected to be slightly different under the Senate plan than the House version, which the CBO said would result in 23 million more Americans being uninsured, although the agency estimates that many of the people losing coverage would be those who chose not to buy insurance because it would no longer be legally required, as it is now under Obamacare. The CBO said the Senate version would cut $772 billion of Medicaid funding over the next decade, compared to $834 billion in the House bill. The Senate bill’s 15 million person decline in Medicaid enrollment is slightly higher than the drop that would result from the House bill, which was estimated at 14 million people. Both bills would repeal a variety of Obamacare tax increases that largely targeted wealthy Americans and the health care industry; those tax cuts are worth about $541 billion in the Senate bill, compared to $664 billion in the House version. In terms of its costs to individuals, the CBO estimated that a 40-year-old with an annual income of $56,800 would pay about $5,000 in yearly health insurance premiums under the Senate Republican bill, about $500 less than the same person would pay under Obamacare. But a 64-year-old making the same amount of money would pay $4,400 in yearly premiums under Obamacare, compared to $16,000 a year under the Senate health care bill. If those premiums are combined with a high deductible, the cost of health care could equate to nearly 40 percent of that 64-year-old’s annual income. “This legislation would generally reduce the percentage of income that younger people had to pay toward their premiums and increase that percentage for older people,” the CBO wrote. The CBO goes so far as to say that few low-income people would buy health insurance, even though they would qualify for subsidies under the Senate plan, because the tax credits would be pegged to plans with high deductibles. That would make the total cost of the plan unaffordable, even if a person can pay the premiums. These findings are unsurprising because the Senate, despite its suggestions that it would effectively toss out the House bill and create a new one from scratch, wound up including similar provisions to those in the bill passed by the lower chamber last month. But the CBO score is important because those who want to kill the legislation, including Democrats, medical groups like the American Heart Association, the AARP and other constituencies, are very likely to cite these numbers when they blast the Senate proposal. And these findings could complicate Republicans’ plans to pass the legislation through the Senate — which they are rumored to be trying to do as soon as this week — by giving reluctant GOP senators a reason to vote “no” or demand changes to the proposal. The legislation needs at least 50 votes to pass the Senate (Vice President Mike Pence would serve as the tiebreaker if necessary); there are 52 Republican senators, and several have voiced reservations. On Friday, Dean Heller, a Republican senator from Nevada, said he opposed the legislation, at least “in this form,” because it “takes insurance away from tens of millions of Americans.” The CBO has now buttressed his position. Phasing out some of the federal funding for Medicaid expansion over three years rather than reducing funding for expansion all at once. Using a formula for Medicaid funding that would provide less money to states for the program than the House bill would have provided — and far less than is allocated under the ACA. The agency predicts that, under the Senate plan, about 15 million fewer people will be enrolled in 2026 than under current law. But the agency also foresees additional drops in Medicaid enrollment after that date. Barring states from waiving the ACA provision that prohibits insurers from charging higher prices for insurance plans to people with pre-existing conditions. However, this legislation, like the House bill, would allow states to waive some of the insurance laws implemented under Obamacare, and there appear to be a lot of ways that insurers could get around the ban on charging sick people more. If states drop rules requiring insurers to offer certain benefits, “coverage for maternity care, mental health care, rehabilitative and habilitative treatment, and certain very expensive drugs could be at risk” in those states, the CBO concluded. Penalizing those who went without insurance for more than 63 days by imposing a six-month waiting period before they can get coverage in a new plan. All three systems — the ACA, the House bill and the Senate bill — seek to punish those who don’t have insurance in order to discourage people from buying health insurance only after they have gotten sick and to make sure that relatively healthy people get insurance, which helps keep insurers’ costs down. The ACA does this through the so-called individual mandate, which charges a tax penalty to people who don’t have health insurance. The House bill would have done it by allowing insurers to impose a 30 percent surcharge on premiums for people who had gone without coverage for 63 days or more in the previous year. “Imposing that waiting period” proposed by the Senate “would … slightly increase the number of people with insurance, on net,” the CBO concluded. Technically, the report comes from the CBO and Joint Committee on Taxation.